I had the opportunity to visit Reykjanesbær last week. It is very easy to walk away with a sense of great optimism after hearing the Mayor’s vision for the area and seeing firsthand the work going on at the Duushús, Viking World, and the Keilir Institute. It is absolutely amazing what Iceland has accomplished in only four years since the Keflavik base closed and it´s quite impressive to hear the plans they have for the future. Everywhere I went, I could see large and small reminders of our shared history. I can fully understand the mixed feelings on both sides that accompanied the closure of the base. Looking to the future, it is great to see American firms interested in the area, as witnessed by the plan to build a silicone factory and interest in expanding aluminum operations and establishing data centers. Our Embassy is committed to supporting Reykjanesbær for years to come. A little over a week ago I had the pleasure of visiting a farm near Selfoss and to experience Icelandic hospitality at its best. The home-made food, the Brennivin toast, the coffee, the conversation and the Icelandic singing made us feel very welcome. With all due respect to my fellow humans, the best part was being able to "meet" Icelandic horses and sheepdogs. They are truly noble animals. 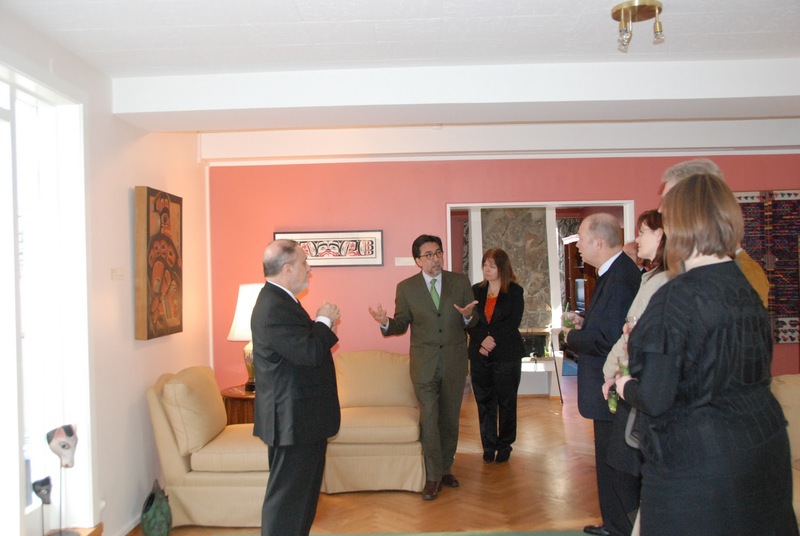 Bob Soppelsa (left) with Ambassador and Mrs. Arreaga (center). 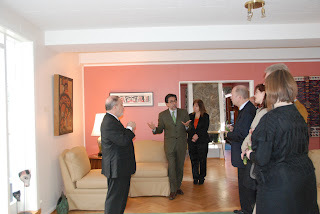 This week we received our “Art in Embassies” collection for my residence. A good portion of the art is from native artists who are members of North American nations that flourish north of 60 degrees latitude. One might think there is little in common, besides geography, between Iceland and these North American nations, but that is not the case. Some of the Haida andKwakwaka’wakw pieces in the collection underline the importance of spirituality for these nations and their strong connection to the sea. I know Icelanders easily identify with both of these concepts. We also wanted to share art that was created by artists with a global perspective. Two of the artists in the collection spent a good portion of their lives in the Foreign Service where they picked up themes and techniques that provide unique perspectives. Art is truly an international language. I had the privilege of attending the first-ever worldwide conference for U.S. Ambassadors. It was a historic event where we had the opportunity to hear from our top leadership and to compare notes with colleagues from every corner of the globe. Secretary Clinton challenged us “…to engage in renewing our alliances, forging new partnerships, and elevating diplomacy and development alongside defense as pillars of American foreign policy and national security.” She laid out clearly the budget difficulties we confront and shared her thinking on how we can accomplish our mission by taking fresh approaches to the way we do business, especially through interagency coordination. Vice-President Biden spoke to us about the challenges we confront throughout the world but shared his optimism about our ability to work with our partner countries. Overall, it was a fantastic week of learning, sharing experiences, and hearing clear messages from our leadership. Yes, I had a chance to speak my native language with a group of vibrant Icelanders who are studying Spanish at the University of Iceland. I was impressed with their knowledge of the language as well as their interest in foreign affairs. This was part of the Embassy’s efforts to provide Icelandic students with information about studying in the United States. We were quite pleased to hear that several of them would like to do so. The Federation honored me with an invitation to speak to the group at their annual meeting. I used the opportunity to share my views on Iceland’s enormous economic potential and the importance of having a clear and predictable business environment to attract investment (both domestic and foreign). I enjoyed meeting the federation’s leadership and several of its members. The closing event of the Winter Lights Festival was quite interesting and charming. There is something very European about walking around a pond following a musical band and a group of people holding torches. The walk was punctuated by fire breathers, spontaneous huggers, and a small group of singers. My family and I enjoyed it very much. In a very typical Reykjavik fashion, we had blue skies, sleet, and snow in the space of one hour. Ambassador Arreaga with Spanish and French students from the University of Iceland.